Mr. and Mrs. Watson have a pet pig named Mercy. Which really isn’t all that odd, since my Aunt once had a pot-bellied pig named Reginald…but I digress..What is odd is that Mercy, despite her best attempts to just spend her days eating toast “with a great deal of butter”, somehow manages to solve every mystery and crime that comes to Deckawoo Drive. 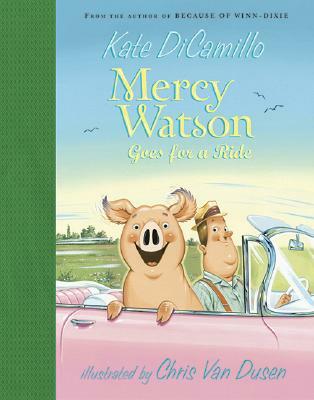 She is, as Mr Watson puts it, “a porcine wonder.” And readers young and old will agree that Kate DiCamillo (of “Despereaux” fame) has again created a series of instant classics with her six “Mercy Watson” books. These easy-to-read chapter books will delight your children and keep the parents laughing with the old lady antics of Eugenia and Baby Lincoln who live next store and an animal control officer named Francine Poulet. Don’t walk, run to your local library for Mercy’s sake.